One of the first of the Bedford CA series from 1956, this is a nice-looking pale blue version with the Mechanical friction motor. It is billed in some places as a ‘Personnel Carrier’ but I used to call these Dormobiles and that is also what is written on the baseplate! The baseplate on this model has the front axle closed in mounts. It also has the curved grill. These M versions were really not terribly popular and are quite hard to find in good condition. This one has very good paintwork, windows and wheels and the motor works very well. Nice. 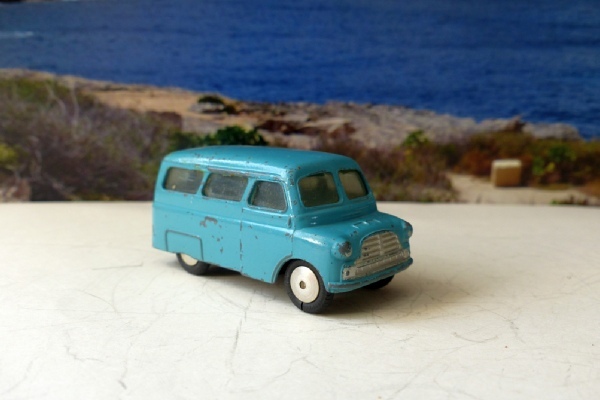 There are lots of different models of these little vans and I was never particularly fond of them at the time and had none in my collection. So these are the first I have seen up close and they do have a certain charm as well as some mystery as to their variations! This one is in the Eilum Collection.